My symphony arrangements are played regularly by the New York Pops at Carnegie Hall and major symphonies around the country. On Broadway and national tour, I conducted Anthony Quinn in Zorba, Hal Prince’s production of Cabaret, Cy Coleman’s City Of Angels and Robert Goulet in Camelot; I played in the pit of Cy Coleman’s The Will Rogers Follies, Tommy Tune’s revival of Grease, the 1992 revival of Guys & Dolls, and off-Broadway’s Ruthless. I'm currently co-librettist, musical supervisor and arranger for the Broadway-bound Harold Arlen musical One For My Baby. I debuted in New York as the original arranger/pianist for Forbidden Broadway. I created the book, music and lyrics for my one-man show Miss Gulch Returns! (Back Stage Bistro Award), now produced by theaters nationwide; wrote book, music and lyrics for The Two Svengalis, and contributed songs to the off-Broadway productions Whoop-Dee-Doo! and Burly-Q, and wrote music and lyrics for Universal’s Creature From The Black Lagoon. My TV credits as composer, arranger, and/or Musical Supervisor include HBO's Cathouse: The Musical, Olivia, Wonder Pets!, and The Magic School Bus (Emmy Award.) I've produced and arranged numerous CDs for Broadway performers and big band singers. My favorite activity: presenting my concerts of classic show music with top Broadway performers and the Fred Barton Orchestra in my American Showstoppers series. SHEET MUSIC for my songs is available on www.musicnotes.com, including "Pour Me A Man." My recent symphony orchestrations include "Summer In Ohio," by Jason Robert Brown, performed by Betsy Wolfe and the New York Pops (Steven Reineke, conductor) at Carnegie Hall on March 11; and a medley of James Bond movie songs, to be performed by Nicole Parker and the Naples Philharmonic Orchestra (Stuart Chafetz, conductor) during the week of March 29, 2016. I'll be creating and orchestrating a medley of Elvis Presley songs for conductor Michael Krajewski's upcoming symphony concerts in May-June. On March 4-5, 2016, I presented the eighth concert in my "American Showstoppers with the Fred Barton Orchestra" series, this time highlighting the music and lyrics of Cole Porter. Performers included Tony-winner Beth Leavel, Drama Desk nominee Lisa Howard, Drama Desk nominee Karen Murphy, John Bolton, Paula Leggett Chase, Damon Kirsche, with featured performers Jesse Luttrell and Sean McGibbon. Scott Thompson directed and choreographed, while I hosted, arranged, conducted, and produced, all powered by my 14-piece orchestra. If you love classic Broadway show music, performed by house-bringer-downer Broadway performers of the old school, I'll be presenting my next American Showstoppers concerts in October 2016 (An Evening Of Frank Loesser) and March 2017 (An evening of Kander & Ebb.) My previous "American Showstoppers" concerts paid tribute to the music of Harold Arlen, Jule Styne, Richard Rodgers, Jerry Herman, Cy Coleman, Irving Berlin, and Johnny Mercer. 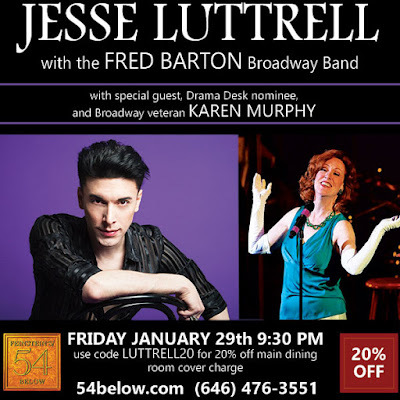 January 29, I returned to 54 Below with my 8-piece Broadway Band, to accompany the sold-out solo debut of post-modern vaudevillian extraordinaire, Jesse Luttrell. Well-known for his burlesque musical comedy revue BAWDY, and his appearances in my "American Showstoppers" concert series with my 14-piece orchestra, Jesse has a shattering voice and a magnetic, old-school, take-no-prisoners personality, which he unleashed on a wide variety of show tunes both rare and familiar, as well as pop songs new to his formidable repertoire. Jesse got one of the best reviews in cabaret history: JESSE LUTTRELL WITH THE FRED BARTON BROADWAY BAND AT 54 BELOW. Karen Murphy, Drama Desk nominee and veteran of nine Broadway shows, appeared as Guest Star, making her 54 Below debut as well. 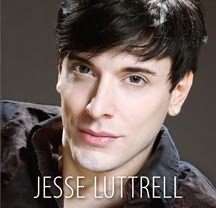 My latest CD – singer Jesse Luttrell's debut, singing 6 show tunes and standards with the Fred Barton Broadway Band – continues to gain worldwide fans on internet radio, sold through iTunes, Amazon, and CD Baby. I arranged, orchestrated, and produced, and we recorded at the fabled Nola Recording Studios in NYC, the last recording session at the 75-year-old historic studio before it closed its doors. Several songs are the first fully orchestrated versions ever recorded. In March, I appeared center-stage at the piano for the triumphant New York debut of my epic "History Of Television Overture" with Steven Reineke leading the New York Pops at Carnegie Hall. Also in March, a totally different TV theme medley, entitled "Anything On TV?" had its debut with the Oklahoma City Philharmonic, under the baton of Larry Blank. Broadway and TV star Megan Hilty continues to sing my orchestrations in her symphony dates around the country, as does Broadway and TV star Jason Alexander, and pop pianist-singer Tony DeSare. 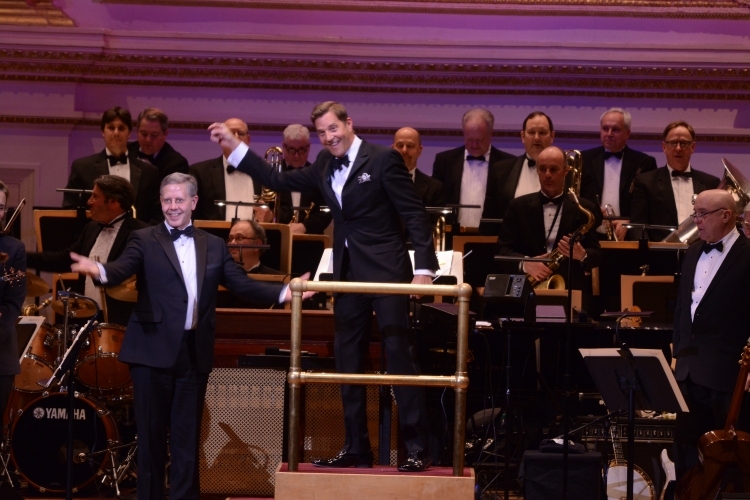 New York Pops conductor Steven Reineke continues to conduct my Pops arrangements with symphony orchestras all over the country. In Fall 2015, my theatre piece MISS GULCH RETURNS! returned to Indianapolis in another triumphant production starring Brent Marty, presented by Theatre-On-The-Square. • "ONE FOR MY BABY," the new Harold Arlen musical, for which I created the arrangements and co-wrote the book with Scott Thompson, had a sold-out preview performance of the score and some scenes at NYC's 54 Below on April 30. Our show has found its lead producers, who have launched the Broadway machinery which will bring the show to the Great White Way in 2016. Here's a nice write-up which followed our pull-out-the-stops workshop production: Read here. • "THE MAGIC SCHOOLBUS," the Emmy-Award-winning TV series starring Lily Tomlin, with music by Peter Lurye and Fred Barton, is now available on Netflix and the series has been announced for a "reboot" with new episodes coming down the pipeline. Meanwhile, my TV shows continue to air for kids of drastically different ages: look for "Wonder Pets!" on Nick Jr., and "Cathouse: The Musical" on HBO, as well as "The Magic Schoolbus" on Netflix or on network in various countries overseas. © Fred Barton, 2012. Powered by Blogger.